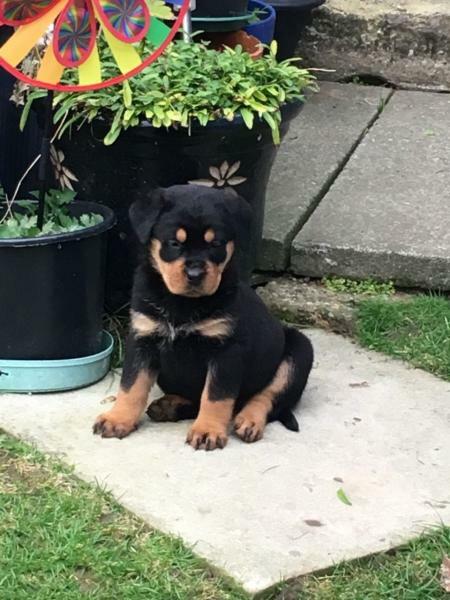 We have a huge litter of Rottweiler pups. Both male and female available. Both parents can been seen. Pups have been vet checked, wormed an de flea treatment. Will leave with puppies starter kit, food, bowls, collar and lead, blanket and toys. These pups are brought up around children and other animals. Our full attention has been paid to the pups.Ready Sunday please leave email and i'll get back to you as soon as possible due to people ringing during the night.